The Primed and Ready smoothing makeup primer preps the skin, providing a beautiful base for easier makeup application and ensures your makeup remains intact throughout the day. It has the strangest consistency. It feels like silicone and almost looks like what you would imagine the inside of breast implants (sorry!) to look like. But when on it smooths on really lovely and leaves almost a velvet feel to my skin. I've used this more often than the Fix Me Up long lasting makeup fixer, and I actually quite like it. It doesn't keep my oil at bay all day, but it does prime my face perfectly for makeup application and it keeps my makeup in place all day. And even then it's only really my forehead where the oil starts showing through, so it's good at keeping it at bay elsewhere. I think the price is very reasonable, just £3.99, but I do think the tube is very small at only 18ml. If this was my regular primer I'd probably have to repurchase every 4-5 weeks and although it's only £3.99, it would soon build up. You can find it on the Boots website, and it is available in both Boots and Superdrug stores nationwide. 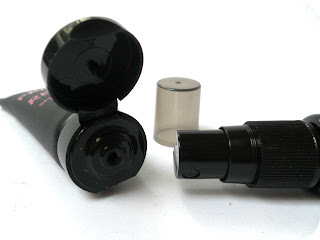 The Fix Me Up long lasting makeup fixer secures your makeup in 'one' misting motion. Now I don't know about you but regardless of what setting spray I use, one mist does not cover all of my face. So I think that is a little bit misleading in their advertising. Although this does keep my makeup in place, I don't think it does anything more or better than my E.l.f. Make Up Mist & Set. So I wouldn't be too fussed about repurchasing this! It comes in a teeny tiny spray bottle which is perfect for your handbag and costs £3.99 per 18ml bottle. You can find it on the Boots website, and it is available in Boots and Superdrug stores nationwide. The primer was okay, but i really hated the scent of the spray! I really love the primer, it just love the texture on my face! & I don't think I'll be repurchasing the spray either, I didn't think it worked to be honest! Helpful review. Would love to see one on the elf setting spray as i'm really interested in these. I'm pretty hooked pn primers at the moment, but never tried a fixer! Interesting. I love the fix up spray! But you're right, you do need more than one spray! Im always looking for the best new primer, even though I have some good ones. This one sounds good, I love all the UK products you have over there. I haven't been a fan of the Collection collection, but these 2 seem like good products to re-try to see if I can make the brand work for me. I received these too and i'm not that fussed with them, i could easily live without them!